The “ramp up time” is the time taken for the heated floor to reach the desired temperature. During the ramp-up time, the underfloor heater will be running at 100% power. Once the heater has reached the desired temperature, it will only have to maintain that temperature by cycling on and off meaning it uses much less power than during the initial ramp-up time. The faster the system heats up, the less power it uses making it cheaper to run. To achieve a highly responsive system, you should pay close attention to insulation and ensure it is up to sufficient levels. HOW TO USE UNDERFLOOR HEATING EFFICIENTLY? At Warmup’s Research and Development centre we are constantly testing to see the best way to run underfloor heating and to provide the easiest and most convenient way to reduce the running costs involved with the system and it quite often reveals some noteworthy results. 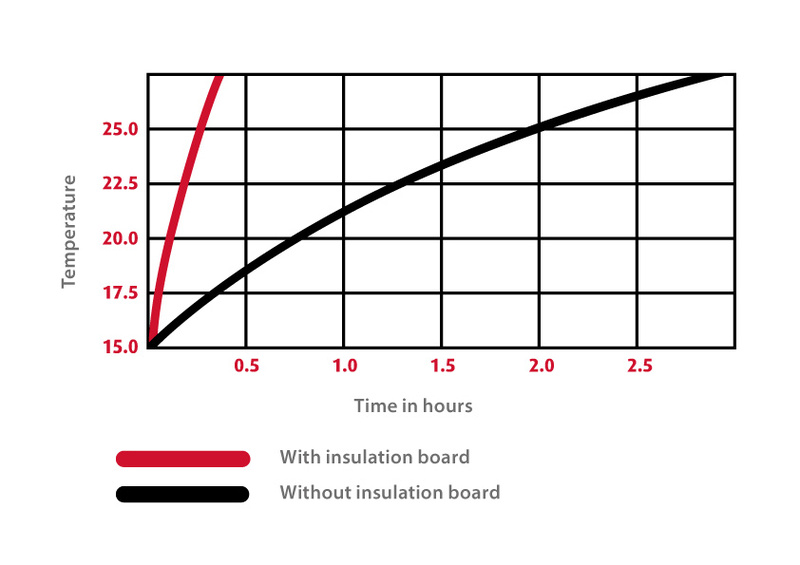 Our extensive research conducted on the impact of proper insulation on energy usage has shown that quality insulation is key to improving your ramp-up times. Upon testing, we concluded that when using Warmup insulation boards in conjunction with same-brand underfloor heaters, floor heat-up time was cut significantly. The floor can heat up in as little as 20 minutes when using insulation compared to over 2 hours on an uninsulated subfloor. That not only constitutes to an impressive saving on running costs but also means the time it takes for your floor to be warm and toasty, which is the main reason to have underfloor heating anyway, is significantly faster. With electric under floor heating, the best place to install insulation is right beneath the heating system. The insulating material will stop the heat from spreading downwards, reflecting it back up to the floor finish instead. This is particularly pertinent when the subfloor is concrete as a non-insulated base can dramatically delay the heating effects from being felt through the final floor finish. Warmup currently offers two types of insulation to be used together with their products. The Warmup 6mm insulated underlay is a thin yet efficient thermal barrier that also reduces contact noise and resists moisture. It has been specially developed to complement the Warmup Foil Heater under soft and resilient floor coverings such as carpet, vinyl and linoleum. The Warmup Insulation Board, on the other hand, not only directs the heat to where it needs to be but doubles up as a sturdy tile backerboard for increased heater stability. Made of extruded polystyrene, the board is faced on both sides with fibreglass mesh embedded into a thin cement polymer mortar. The board is tough and water-resistant and can bear impressive weight loads of 30 tonnes per square metre. It is available in varying thicknesses and is suitable for most applications. Try our Underfloor Heating Product Selector to find the right products for your project.